This template is perfectly suitable for any king of law offices, lawyers or attorneys. Being fully responsive, the site based on it will be easily rendered on any portable device. Utilizing technologies like HTML5, CSS3, Bootstrap and being W3C valid, this theme can be the perfect skin for your online resource. The template is well commented, bulletproof coded and built with SEO on mind. As for the visual presentation, the content blocks are arranged in a careful manner, thus allowing site visitors to get info they need in a matter of seconds. Bootstrap is a front-end framework for developing websites and web-applications. By making usage of Bootstrap, you may construct 100 % responsive website pages utilizing HTML and CSS based themes for typography, print styles, forms, buttons, tables, et cetera. Responsive design might help your online site look equally well on display screen of any existing home pc or hand held gadget. When a end user types something to the research bar, the search engine seeks it depending on numerous rules. Search Engine Friendly theme's code is almost certainly specifically apparent and structured to try to make Website seo attempts less difficult. You don't need to be a professional at SEO to get high rankings in Google. WordPress SEO plugins allow to write SEO-ready titles and meta descriptions, and in addition analyze on-page content, enable you to create XML-sitemaps, and a lot more. How many applications, programs etc can I use to integrate with the Law Joomla design themes under one extended license? The extended license gives you the right to use the purchased Law Joomla design themes for the integration with one software/freeware/application/CMS/sitebuilder only. In case you would like to use the template with the other application, the other license is to be acquired. What is a buyout purchase license for Law News Joomla template? If you purchase the product at a 'Buyout price' it guarantees that you are the last person to buy this template from us. It means that this Law News Joomla template may have been sold before a couple of times (see 'Downloads' number in item's properties) but only you and people who bought the template before you will own it. After this kind of purchase the template is being permanently removed from our sales directory and is never available to other customers again. The buyout purchase license allows you to develop the unlimited number of projects based on this template, but the template should be customized differently for every project. Can I get the Joomla theme for Law News in higher resolution to use for printing? No, we design Law News Joomla designs optimized for web resolution only. Can I resell Joomla designs for Lawyer I bought the developers license for? You cannot resell the customized Joomla design theme for Business & Services as a template, but you may sell it as a project to your client. Can I put low resolution thumbnails of Joomla designs for Business on my website for my clients to choose designs? Is it possible that Template Monster will contact my client which website I made from Template Monster's website Joomla design for Business Magazine ? Yes, our legal department checks licenses regularly. In case we won't find designer's contact information on the site which was made from the Joomla design for Business Magazine of ours we will contact the owner of the site directly. I ordered a Solicitor Firm Joomla template but haven't received the download information. In case of not receiving the download information of a Solicitor Firm Joomla template, please contact our Billing Department via support chat by phone or e-mail. In what cases I don't need the extended license for Law Journal Joomla templates? Can I put a line at the bottom (or any other spot) of my new product "Website development by Company name" after purchasing Joomla design for Law Books ? Yes, you can place a note at the bottom (or any other spot) of my product "Website development by Company name". Nevertheless, you cannot place "Website design by Company name" while using one of Joomla design for Law Books . 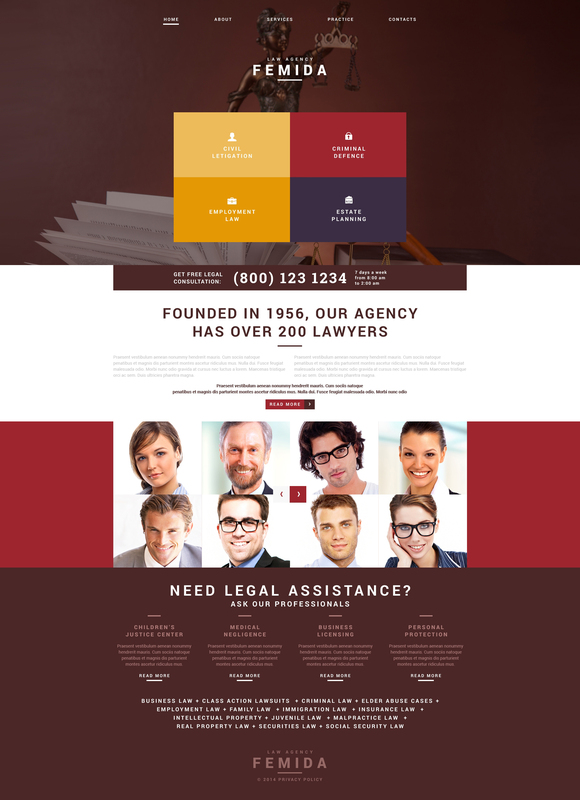 Will you help me to customize my Joomla template for Law Firm? We do not provide any help or instructions on Joomla template for Law Firm customization except for www.template-help.com help center. If you are not sure you can customize the template yourself we recommend to hire a design studio to customize the template for you. Can I integrate the Joomla template for Law Firm with third-party software or applications for development of my new products? No, you cannot get the developers license for development of Joomla template for Law Firm or other products. Can I customize the Joomla theme for Society & People Support? Yes, you can customize the Joomla theme for Society & People Support to any extent needed. You cannot use a header of the template for one project though, and images from the template for the other project. What will I see instead of the images after installation of the Small Business Joomla design? After Small Business Joomla design installation you will see blurred images included for demo purposes only. What is Developers License for Society & People Joomla theme? If you purchase a Developer's license, you are granted a non-exclusive permission to use the Society & People Joomla theme on up to 5 domains for projects belonging to either you or your client. Can I use graphics from Small Business Joomla design I purchased for use in printing? Yes, it's not prohibited to use the Small Business Joomla design graphics for printed material, but the resolution of the templates graphics ( except for logo templates) is not enough for printing. Will TemplateMonster help me to install my Joomla template for Law Office? Some of our products like osCommerce templates, Zen Cart templates, etc. require installation to operate. Installation services are not included in the package price. TemplateMonster though offers you a variety of sources to help you with installation of your Joomla template for Law Office including installation instructions, some articles with our Online Help Center. Our Knowledgebase contains customers questions and most frequent problems. Anyway, you can always refer to our partners from TemplateTuning.com to install your Joomla template for Law Office for you for a small fee. Are there any limitations on selling the Society Joomla design theme as the integral part of my new product? I would like to make payment for Joomla design for Business Bureau by company check. Is that possible? Please use Skrill payment option. They accept payments by check.You can place an order for Joomla design for Business Bureau on the site under the name of the company and choose Skrill merchant system for making payment from the company's account. To initiate bank transfer, please create an account here - www.skrill.com, add the number of your bank account and verify it. After that, you can place an order on our website and choose Skrill on checkout page. When the payment is made, the product will be sent to your e-mail along with the invoice under the name of your company. What is the difference between unique and non-unique Law Firm Joomla design theme purchase? Non-unique purchase:Non-exclusive purchase means that other people can buy the Law Firm Joomla design theme you have chosen some time later. Unique purchase:Exclusive purchase guarantees that you are the last person to buy this template. After an exclusive purchase occurs the template is being permanently removed from the sales directory and will never be available to other customers again. Only you and people who bought the template before you will own it. Can I put a line at the bottom ( or any other spot) of the customized Business Joomla design theme "Website design by Company name"? No, you cannot place a line at the bottom ( or any other spot) of the customized Business Joomla design theme saying "Website design by Company name". Nevertheless, you can place "Customized by Company name". Is it possible to reactivate my download link for Joomla design theme for Law Articles if it was deactivated after 3 days? Yes. Please re-activate the download link for Joomla design theme for Law Articles within your account under the Downloads tab or contact our billing department directly regarding that. Can I resell the customized Law News Joomla template? No, you cannot resell the customized Law News Joomla template as a template but you may sell it as a project to your client (see paragraph 1 ONE TIME USAGE LICENSE for more details). I had an old HTML site for this company and it was way past it&#039;s use-by date so I got together with the Principal and we decided on #50800 as the best fit. I did have difficulty installing this template as it hung on the config installation but I got around. If you don&#039;t have experience doing this you definitely will need TM&#039;s support. It was a quick build for the website and the customer loves it. It didn&#039;t require much in the way of customisation so it worked as an off-the-shelf product.